What a way to start the hunt! With my license in hand (this time) I went back to the same treestand that I hunted on the first morning last year. I really like this stand, it's in an area that's active all morning long. At first light, a nice 8 showed up but big deer are big for a reason. He checked the wind first before coming in and he winded me. 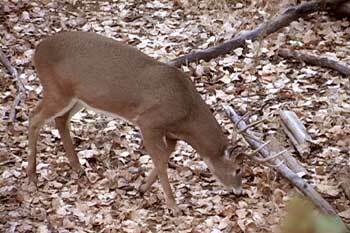 Shortly after first light, a small buck came in and fed around my stand for a half hour. I used the opportunity to practice drawing and setting up my camera. I drew on him about two dozen times before he picked me off and ran into the thickets. 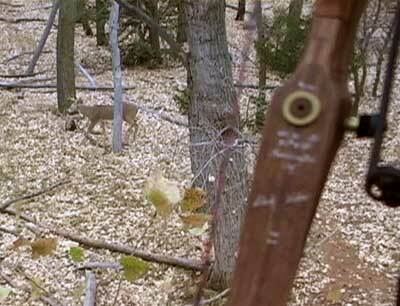 In total I saw about 10 deer this morning, half were bucks with only one close to being a shooter. It was a great morning. Kent had a hunter last week who had seen a huge 8 from a stand they call the River stand. I decided to hunt there tonight. The wind was perfect for that stand, the only drawback, Kent mentioned, was a remote chance of seeing some wild hogs. I made sure it was OK to shoot them if they came in and Kent said - "absolutely." I was settled in a 3:30PM and forty minutes later I heard a racket heading down the trail. Here comes 20 hogs into my treestand. They started to root around, squealing and carrying on. I flipped on the video camera and picked out the largest one. 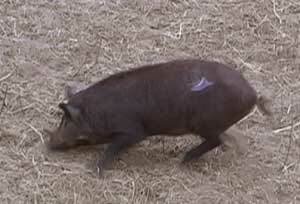 A well placed arrow found its mark and the hog ran off. Not wanting to leave a dead hog laying around, I waited a bit, then trailed it. He didn't go very far and I dragged him away from the path the deer come in on. I started to think that this hog would make an excellent Bowsite.com bloodtrail competition, so I left my bow at the ground and climbed up the stand to get the camera. While I was gathering my gear, another group of hogs came in from the North. There was one real nice boar in there so I said "what the heck" and very quietly climbed down the stand. 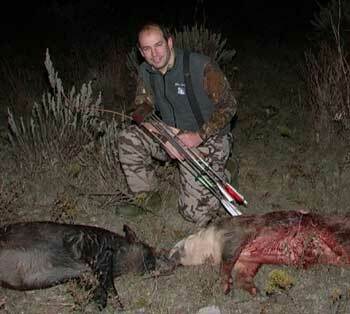 The hogs never saw me as I picked up my bow, nocked an arrow, and drew on hog #2. Another great shot and the Hog tore off. I was two for two. I climbed back in my stand, waited a bit, then bloodtrailed the 2nd hog. It had only gone about 70 yards and I dragged it to the fence where I would be picked up later. With two nice hogs under my belt, I climbed back into my stand - hoping for a buck. Instructions - Depending on the size, length, and quality, some videos are available in various formats. If you are using a dial-up connection at 56k or slower, choose low speed. If you need to download the plug-in, click on the Format Column. I wasn't expecting to see anything, with all the hog action and bloodtrailing, but I underestimated how great the hunting is here. 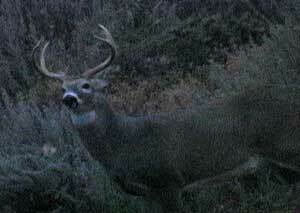 At last light, a gigantic whitetail with tines visible from 300 yards away, moved downwind of me. I picked up my binoculars and glassed him. I could not tell what he was, all I know is he was BIG. Unfortunately, he appeared to be nervous and moved off. Just before dark, I saw another deer approaching and put the glasses on him. It was a heavy, perfect 10. My heart started thumping. 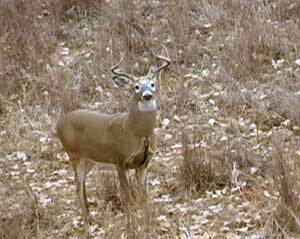 He moved towards me and walked 25 yards from the stand. A bit too far out of range for my recurve so I watched him walk off. Kent and I guessed he was about a 150 class 10 - a little light on width but very heavy and symmetrical. The hog on left was shot from the stand, the hog on the right was shot from the ground. What a fun hunt! Last year's bowhunt was fantastic. However, the bucks were hard to pin down because they were in full rut. 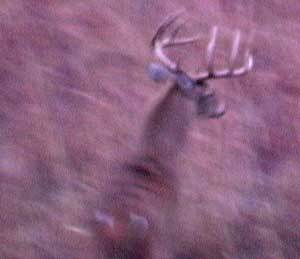 So Kent Jarnagin and I decided to bowhunt a week earlier - during the pre-rut. 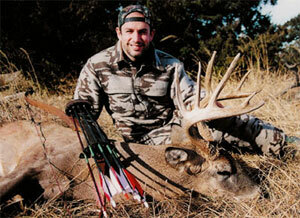 We'll be bowhunting the same familiar spots and holding out for a trophy-caliber whitetail. 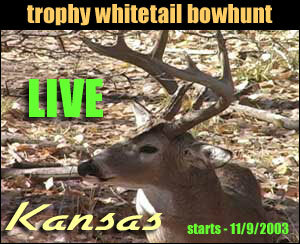 If you are new to our live hunts - here's how we do it. I bring a digital video camera into the field and record everything that happens. Depending on the activity, and the amount of time I have between hunts, I may do both a morning and an evening upload. As soon as the hunt is over and I'm back at the farmhouse, I begin editing my video footage, creating web snapshots from digital video and converting them to web format (JPEGs). I then write a synopsis of what happened, do a quick spell and grammar check, then I upload the package to that day's update. This will all happen sometime before midnight (hopefully) Central time.